There are so many films out now that almost everything has been done before; so horror writers have a big problem coming up with some original creepy monsters. We’re tired of seeing bug-eyed aliens, Godzilla and king kongs, we’re almost un-shockable now and immune to being frightened, so if you’re tasked with creating a movie monster it’s time to think as weirdly as the very darkest depths of your imagination. The monsters in this list aren’t always scary, most are just confusing and leave all sorts of questions behind, but chances are you wouldn’t want to meet any of them in a dark alley. 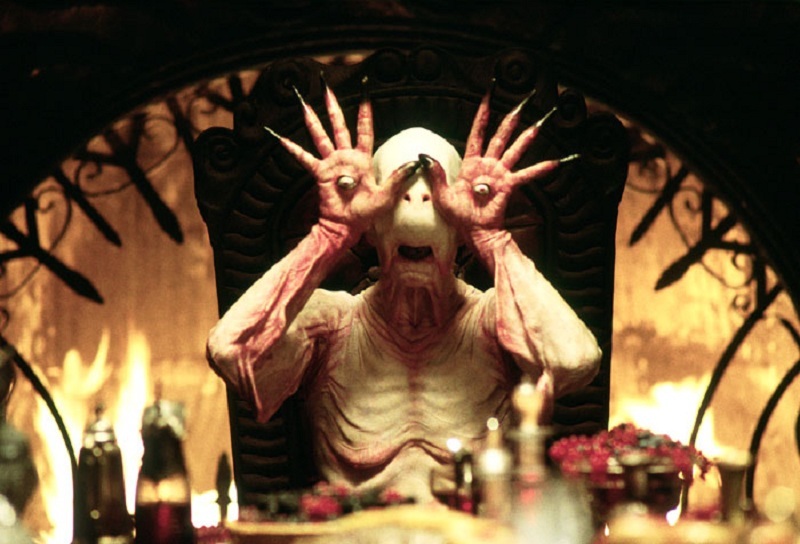 This guy is the stuff of nightmares; some sort of humanoid with too much skin and seemingly no eyes – when the heroine of Pan’s Labyrinth finds the delicious banquet guarded by the Pale Man, she decides to sample it, regardless of the blaringly obvious depictions along the walls that show what the Pale Man does to kids who eat from his banquet – he picks up his eyes and becomes the creepiest, most haunting thing you have ever had the misfortune to see. We’re not sure which is worse; his Voldemort-style face, or his long, spiky fingers. The film title says it all really; this B-movie is beyond bizarre. You can forgive them a little for the awful effects when you learn this film is a spoof made on a $100,000 budget. These awful little critters eat people, and as if that isn’t weird enough their one weakness is the song ‘Puberty Love’ which causes them to shrink and become easy to squash. There’s little explanation as to why any of this happens, but you’ll never look at a tomato the same way again. It might look like a few pots worth of silly putty, but the Blob is actually a menacing monster from outer space… It’s got a taste for humans, and the worst part is it grows in size with everyone that it eats. It’s only when a couple of 50’s teenagers accidentally hit the Blob with a CO2 fire extinguisher that they realize it can’t function properly in the cold. So what’s the solution? Get the army to drop the Blob in the middle of the artic and forget the whole horrible thing ever happened. March 13, 2019 Nige Comments Off on The joy of an early sixties “Yoof” film.